The fifteenth largest telecom service provider in the world just did it, through its Binge On service. What do Airtel Zero and Free Basics have in common? It’s that they both violate net neutrality norms. What’s the most common complaint against them? It is that either Facebook or Airtel will find themselves as gatekeepers, putting them in a position to throttle speeds for websites that are not amongst their partners. But how exactly will Airtel or Facebook do that? Yes, we all agree that a free and open Internet is what the common man should have, but the layman often asks, “Is that really possible? Can Airtel really do this for its users?” For the answer, you need to look at a similar debate around net neutrality and zero-rated plans ongoing overseas right now. T-Mobile, the fifteenth largest (by subscriber) mobile phone service provider in the world, introduced a service called Binge On. The service allows T-Mobile subscribers to watch certain video content, without affecting their data caps. Just like Airtel said for Airtel Zero, T-Mobile has also invited content providers to partner with it, striking deals with big names like Netflix and Hulu. The promise? That T-Mobile will ‘optimise’ the video coming from these companies for mobiles on its network. The optimisation is supposed to compress streams to 480p, which is adequate for mobile displays, but allows better streaming experience on the go. T-Mobile’s cleverly worded explanations always mentioned that the telco ‘optimised’ video for mobile viewing. However, the Electronic Frontier Foundation published an investigation, which has basically undone all the marketing jargon that T-Mobile put into its service. The EFF’s investigation found that instead of ‘optimising’ the video, T-Mobile is throttling all HTML5-based video streams to around 1.5Mbps (wait, that’s slow? First world problem alert!). - Downloading a large non-video file for comparison (“Direct Non-Video Download”). 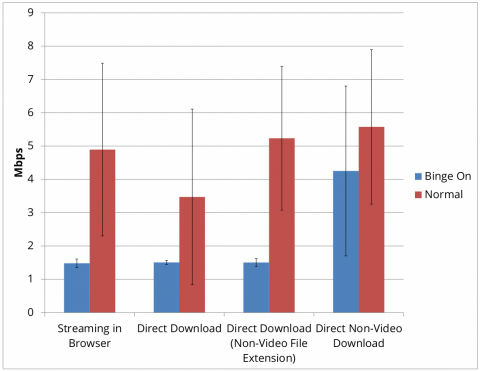 EFF then published its findings in the graph (below), showing that T-Mobile was in fact throttling video from all content providers, instead of detecting where a particular video stream was coming from. This obviously isn’t what optimisation means. While T-Mobile doesn’t charge content providers to join its Binge On platform, it has some technical requirements. Through throttling, if a user is streaming video from a website that can’t downgrade based on his/her connection, Binge On would still throttle the video, hence resulting in a choppy experience. This means that while T-Mobile’s partner sites will be able to deliver seamless video streams at 480p, many others websites would not, hence discouraging users from using such websites on the T-Mobile network. Not only will the speed be slow while streaming, the EFF’s findings also show that Binge On affects download speeds on T-Mobile’s network as well. So, even if a users is downloading video from a non-partner site, the speed will be throttled. T-Mobile itself has now confirmed that the EFF’s allegations are true. It is important to note that throttling in itself is not illegal or against net neutrality. In fact, throttling is a method used to effectively manage networks when they’re congested. However, the EFF’s claims against T-Mobile say that the throttling on Binge On is happening irrespective of whether its network is congested, which could be seen as a violation of the user’s Internet freedom. While T-Mobile could and is arguing that its users have been informed of the same, meaning that they’re opting for the same, the same wasn’t done before the EFF’s findings. 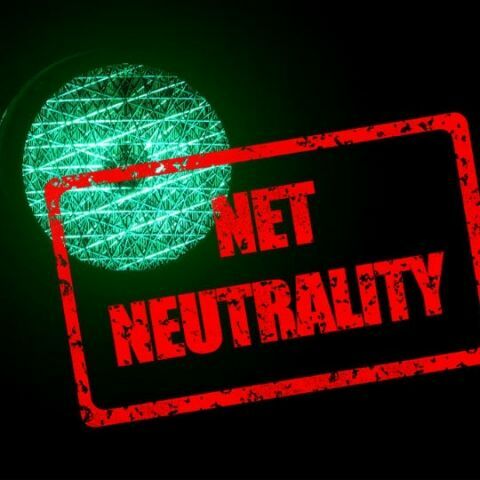 In the Indian context, zero-rated plans like Free Basics and Airtel Zero have been considered against net neutrality since these bodies may choose to do the same. The cleverly worded explanations given by corporates are usually the same as T-Mobile’s use of the word ‘optimisation’ and it is here that you realise the dangers of zero-rated plans. how do they perform & are they good?